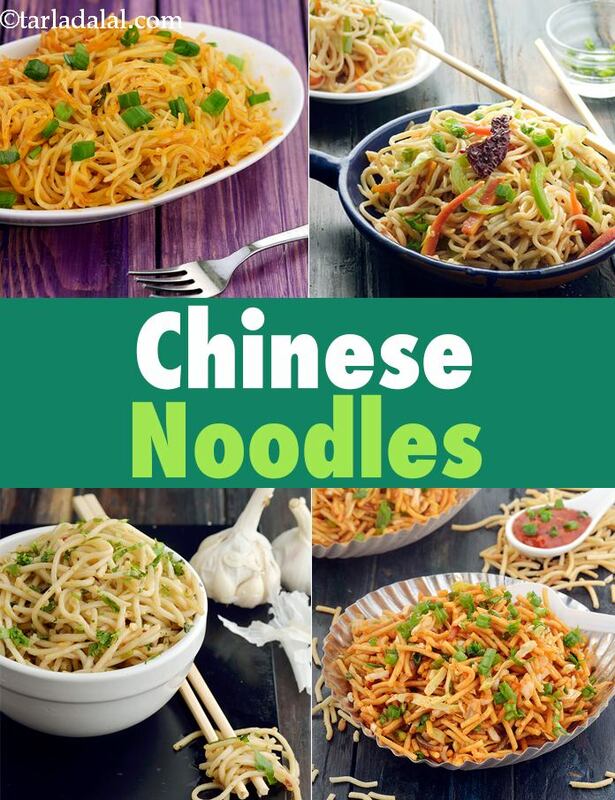 Chinese Veg Noodles Recipe Collection, Chinese Noodles. Noodles is one of the most favorite ingredients in Chinese cooking. There are several types of noodles available, and innumerable recipes using them. While some noodle recipes involve stir-frying the noodles with the other ingredients like vegetables and sauces, other recipes feature plain cooked noodles topped with delectable gravies. Have a go at popular recipes like the Singapore Rice Noodles, Tangy Capsicum Noodles, Schezuan Noodles and Hakka Noodles. The most common and popular Chinese preparation is Hakka Noodles, made with a myriad of colorful vegetables tossed in chilli oil and Chinese sauces. It tastes best when eaten with Manchurian, Paneer chilli gravy. If you don't like plain flour noodles, substitute with rice noodles and savour this aromatic Hakka Mushrooms with Rice Noodles preparation. You can stuff the noodles between spring-roll sheets to make these crunchy Spring rolls that is a famous Chinese appetizer. Garlic Noodles is the simplest, no-fuss noodles made using a handful of ingredients. If you love spicy food , then you can add some chilli oil and schezuan sauce and toss up these Quick Chilli Garlic Noodles. Enhance the noodles with a zingy, spicy schezuan sauce and relish this authentic Chinese Schezwan Noodles preparation of Hakka noodles with sautéed veggies and this pungent sauce. You can use these noodles as a stuffing for rolls and dosa and make fusion foods like Schezwan Noodle Frankie, Schezuan Chopsuey Dosa. American Chopsuey is an Indo-chinese , tangy noodle preparation. Juicy, stir-fried vegetables are served atop crisp-fried Hakka noodles that is both filling and tasty. To try the authentic, signature snack from China, toss this Pan-fried noodles or Vegetable Chow Mein, popularly known as Chau-Mèing made by combing crisped Hakka noodles with sweet-spicy hoisin sauce, and crunchy vegetables. The noodle based popular roadside snack in Mumbai is Chinese Bhel which is made from deep fried noodles, cabbage and spring onion whites. Also there is Vegetable Chow Mein easily available. Everytime I go out with my friends to have a Chinese meals, we end up eating Triple Schezuan Rice because always have a dilemma of whether to eat rice or noodles. Also, this scrumptious dish comes with a bowl of gravy and crispy fried noodles that is filling and satiates the soul. Enjoy our Chinese Veg Noodles Recipe Collection, Chinese Noodles and other Chinese Recipe articles below.